Hunan De Ruo Trade Co., Ltd.
Yellow Powder,ororless, non – solube in water, alkali, organic solvents, slightly solube in 5% diluted hydrochloric acid, solube in concentrated acid, dilute nitric acid, and boiling dilute sulphuric acid.This product is non-flammable, non-corrosiveness, non-explosion hazard. 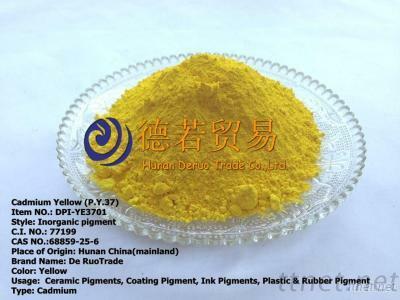 Cadmium Yellow is characteristics of its high tinting strength, excellent light fastness, weather fastness and hiding powder, non Migratory, non bleeding. Cadmium Yellow color is very bright, its color shades from light yellow to bright yellow till reddish yellow. Zns Content Cadmium Yellow , with the increase of Zns content, Its yellow color will become lighter. Filled Cadmium Yellow not only with less manufacturing costs, but also increased its properties in some aspects. Such aspects as lower gravity and oil absorption, and better dispersion in organic mediums.